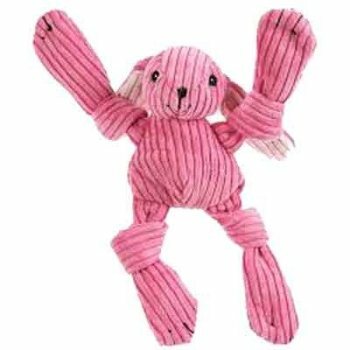 ​Sweetest member of the Knottie family of dog toys, Bunny Knotties are made of a super soft plush corduroy and offer four great, gnawable knots. Each arm and foot has a knot and there is a squeaker in the belly to grab your dog's attention. Tails or ears feature crinkle material for added enjoyment for your dog.